Oscar® Winner Ingrid Bergman, Gary Grant and Claude Rains sizzle in this chiller in which a beauty infiltrating a German spy ring finds herself in love and in peril. I really enjoyed this movie. I think the plot works well and is interesting overall even though the Nazi element to it is a bit dated. There are some suggestive things going on without anything explicit being shown. The pace is slower, but that works to help set up everything that is going on. Bergman and Grant are wonderful in their parts and they have a decent amount of chemistry. Alex works as the villain even though not a lot about him is shared. The way his mother dominates him did make me think of Norman's relationship with his mother in Psycho..or at least what it was like earlier. There is a decent amount of suspense and mystery in the movie even though the mystery could have been slightly stronger. Overall I really liked this movie and thing it is another very well done Hitchcock movie. I did get a review posted on Epinions today...or yesterday. Whatever. I have to say, Marie, I'm a bit disappointed we only get the highlights of your review. Why not post the whole lot here as well? But in any case, get a shift on! I'm just about to catch up. Ish. On holiday in Marakesh with his wife, Jo (Doris Day), Dr. McKenna (James Stewart) is the only one to hear the dying words of a French spy, dragging him into an assassination plot. Soon, his young son is kidnapped and they travel to London, desperate to get him back. This was a pleasant surprise as it was far more enjoyable than I remember. I’ve always considered it one of Hitchcock’s lesser films of this period, but it just goes to prove, Hitchcock couldn’t make a bad film if he tried. He certainly wasn’t trying here, either, despite my misgivings. Ok, it’s a remake of one of his own films which smells of studio meddling to me, but while that film was very good for its time, this improves the story and pace. It loses the originals sometimes wicked humour, but the characters are so much more believable. I had originally considered Doris Day’s role as lazy; a world-class singer playing an ex-world class singer? That’s a stretch! However, the original 1934 version of the role was also a figure in the public eye and it’s a nice touch that a famous face suddenly has to hide real heartbreak of losing their child. 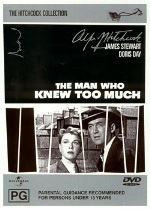 Plus Doris Day is superb at putting across that emotion and I haven’t been fair by dismissing her in the past. Still, the song Whatever Will Be still sounds a bit out of place, but I don’t suppose you can feature one of the finest female singers of all time and just make her cry! But there’s the catch-22. Apparently Hitch didn’t want the song (another sign of studio control), but typically he pulls it off, especially on the second performance with Day singing it within earshot of her locked up son. Written for the film, it went on to be one of her most famous songs. He never did half-measures, did he? Hitchcock’s best moment though is the incredible Albert Hall sequence, still an influence today (Eagle Eye). Once again, a key part of the film is acted in front of an on-screen audience as well as off. The whole thing is nail-biting and it’s great to have Bernard Herrman conducting the orchestra! My favourite though is how he let the music come to the fore so you can’t hear any dialogue, despite everyone having a lot to say. It makes it visually powerful and a throw-back to the silent days. My main problem with the film is the plot. It’s a good premise and a nightmarish situation, but there’s no substance. Normally, as we have seen so often before, Hitchcock’s real interest lay in a sub-plot while the chase/murder/conspiracy is a diversion tactic. Here, there is no sub-plot! No romance, no development, it just is what it is. Still, such empty plotting has been the typical Hollywood method for years (in fact, it’s normally sub-plots that ruin such films! coughEagle Eyecough. Again. ) and this is as much fun as any of them, mainly down to Stewart’s expert everyman performance. I do miss the bonkers dentistry or the chair-throwing scenes from the first one. I suppose that does demonstrate how Hitch has developed from macabre farce to colder violence though. The rules at Epinions have changed at different times over the years about posting things on additional sites. I know for a long time, it was against the TOS there to post the same review somewhere else on the net. Then it was changed to where you could, but they wanted there to be a 100 word difference...they are trying to keep the content on Epinions more unique I think. I'm not completely sure what the full rule on this is now, though I do know there is something in there that if people who are Top Reviewers - which I am in movies - post the same reviews on other sites, they could lose the title. I know the title doesn't mean a whole lot, but I worked hard to get it and I want to keep it. I don't want to violate the rules there. And I we do make a little money off the reviews there too...I still have no clue how they figure it - the company keeps that quiet - but it does add up. It is fine for us to share links and discuss the reviews other places though, so that's what I stick with doing. Yup. For most of the reviews it is a few cents here and there...but some of them have done well for me. And with over 1100 reviews posted now, it adds up. I was not aware of this (you mentioned the rules, but not the money I think). Certainly sounds like something you wouldn't want to risk to loose. I think I forgot to mention the possibility of earnings when I talked about posting reviews there before. Henry Fonda plays musician Manny Balestrero, arrested for a crime he didn’t –could never- commit. His wife (Vera Miles) feels the pressure as the evidence mounts. This is a very different Hitchcock film as he tones everything down to follow the true story of Manny (Henry Fonda), who’s misfortune it is to look very like a man wanted for several robberies. While the style is not so much Cinema Verite, it is certainly reminiscent of Italian Neo-realism, especially Bicycle Thieves from 1948. Like that film the story is terribly bleak, but differs in that it isn’t quite so unremitting and has a natural drama to it (neo-realism kind of just happens). It’s ideal for Hitchcock, because if it hadn’t have been a true story, he’d have eventually written it! It just happens to have similar beats to one of his thrillers and the central conceit of a normal everyday man taken away from his family is just the sort of thing he relished. It bears comparison with I Confess, especially as there is an undercurrent of Catholic faith. Henry Fonda is nothing short of perfect in this role. Such a gentle man, he has boiling emotions behind his eyes, conveying frustration, exhaustion, terror, anger and in a most poignant scene, just desperately sad. Vera Mills matches him in the scenes of her mind breaking down. I bemoaned The Man Who Knew Too Much for not having something to focus on, other than the main plot, where usually he would have a romance building. Cleverly, Hitch hooks onto how Manny’s relationship with his wife breaks down and how he has to fight for it as well as clear his name. It doesn’t matter how innocent you are, there will always be consequences in an ordeal like this. Apparently Hitchcock regretted showing what happens to her, but it’s powerful stuff. It is his most serious film, but don’t be put off as it isn’t a trial to watch; it’s important to note that it’s paced like any drama and ultimately positive. As piece of suspense, it is superb, especially considering the different approach. It’s quite brilliant how he chooses to avoid any kind of obvious direction or editing. I’ve heard people describe it as being like a documentary, but I disagree, because if anything a documentary is even more manipulative. This just feels honest, which is why the cast was so important here. Where normally there might be jump-cut or a zoom, now it’s purely lighting and expression. There are still moments of genius that match the fluidity of the story; note how the camera refuses to be blocked by doorways as we follow Manny into his house and later, the cell. Bernard Herrmann too produces a low-key score; his partnership couldn’t have been more in tune with the director across all their films. I continually defend Quentin Tarantino, but partnerships like that do demonstrate how he could be missing out by steadfastly refusing to let others score his work. Hermann went on to score Taxi Driver and I just read this film was a big influence on Martin Scorcese. It’s obvious now I think about it. This is a very special film and a milestone I think for Hitchcock. It’s a reliable testament to his humility; how he was always able and willing to adapt to new methods that would then continue to inform his work. I hadn't even heard of this one before. It does sound interesting. 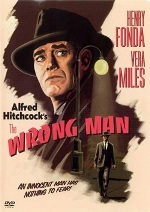 The Wrong Man is like 'and' unlike any other Alfred Hitchcock movie. The story packs tension, the images are spellbounding and the dilemma genuinely frightening. But this time the master of suspense dramatizes the harrowing true experiences of a man tried for crimes committed by a lookalike robber. Henry Fonda plays musician Manny Balestrero, a man full of visible but unspoken rage at his wrongful arrest. Vera Miles is his distraught wife Rose, driven to madness by the ordeal. And the right man to bring the unsetting facts of the case to vivid screen life with documentary precision is Hitchcock. He made New York City a star of the film and cast real-life Balestrero case witnesses in small roles. He shot in many actual locations, among them the Stork Club, Manny's jail cell and Rose's sanitarium. I just don't seem to get into the Hitchcock movies. This movie executed well, even though I feel that the female lead is overacting. In many scenes I feel like she is the embodiment of the many parodies you see about bad acting. Henry Fonda is great though. James Stewart plays Scotty, a recently retired detective crippled by Agoraphobia (fear of heights), hired by an old friend to trail his wife (Kim Novak). After rescuing her from San Francisco bay, Scotty becomes obsessed. Vertigo is Alfred Hitchcock’s most powerful film and amongst the very best of all time. These days, words are cheap and “Masterpiece” is bandied around without really considering what it means. If I had to pick one from his incredible career, Vertigo would be Hitchcock’s. A traditional Film Noir, the plot is very straightforward. Unusually for Hitch there is little to be gleaned from the premise; a retired detective follows a woman at the behest of her husband, who happens to be an old friend. If anything, it’s obvious. Anyone who understands Noir will immediately think they have the whole thing sown up! Vertigo is very ambitious though. That basic story is pretty much done inside 80 minutes starting from the most memorable opening of his films (the much imitated dolly-cam shot), but the fallout is devastating to Scotty. Still it feels like an ending with a wonderful dream sequence reminiscent of Spellbound and certainly the film changes aesthetically, with deep primary colours lighting the hotel room where Scotty’s obsession dangerously manifests and the narrative delicately shifts to Novak’s character as roles are reversed in a superb sequence. It’s a master-class for anyone interested in film writing. Later we return to the room and attention moves back to Scotty for an unforgettable finale after typically Noir-ish revelations following another “false” ending. The two leads are incredible in the most demanding roles of their careers. That either can hold the audiences sympathy while they suffer from deep rooted obsession and guilt is testament to their skill. Stewart is the less surprising given his prolific career (although some may be surprised who dismiss him as an everyman), but Novak is fantastic in what is at least a dual role. Almost forgotten is Barbara Bel Geddes as Scotty’s very close friend. It isn’t her fault, but the screenplay bravely uses her without giving her a resolution. I say the screenplay bravely uses her, because this isn’t an audience friendly film. There's more than a few elements that wouldn't have got passed the studios that couldn't allow Cary Grant to be a villain just a few years before. No-one gets treated well during this film, least of all the viewer! There is little-to-no humour, no set-pieces, no gimmicks, no showing off; even the famous dolly-cam shot feels integral. Hitch commented in an interview that he’d tried to do it for Rebecca, but perfecting it for 15 years pays off by using it so perfectly here. Vertigo is a powerful study of a man losing his marbles while trapped in a doomed love affair and it’s as pretty as it sounds. But like the central character, you can’t help but lose yourself and it rewards the multiple viewings you will surely have with hitherto unseen layers. This is down to the incredible skill of the director, supported by Robert Burk’s photography and Bernard Hermann’s score (script notes show his absolute faith in Hermann). While the middle act really cuts lose with colour, the finest moment is possibly Novak’s sublime introduction in a club with daring contrasts (to signify the heart of the story perhaps), fluid shots and a gorgeous theme. Hitch really knew how to photograph women and like Grace Kelly before her, gives Novak an entrance to die for. There has been much said about this film showing up Hitchcock’s own obsessions and dark-side, especially with blondes, but I think that’s rubbish. He was a master technician who enjoyed playing with perception and he couldn’t have pulled this off if he wasn’t at his most potent and self-critical. He does treat the characters more bleakly than he has ever done before, which is proper Film Noir, but even more powerful than the average example. It’s interesting that he follows The Wrong Man with this. Perhaps doing that true story gave him the confidence to trust the audience to follow a character down a darker path than before. Certainly the way he plays with the narrative is very audacious for the time and sets the scene for what he did with Psycho, although that was much more a genre piece. 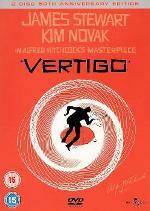 It may be that you won’t enjoy Vertigo, but don’t dismiss it. It isn’t trying to entertain you. It’s one of the most important films ever made, so if you come out of it with a frown, invest another couple of well-spent hours watching it again. The marvellous DVD contains several easter eggs, including an alternative (or at least additional) ending that Hitchcock was forced to add on originally. Pesky studios like closure! Still it is an excellent scene and he does very well to add a splash of humour and keep it in the mood of the film. To see it, select 'Bonus Features', the 'Obsessed with Vertigo' documentary and then the chapter list. Go to the last two pages and after the last marker for the actual documentary, there are more chapter stops. As well as the ending, there are also trailers and production art. oops, thats a reminder to me. I was annoyed to have dropped off the pace. I was planning to finish the Horror marathon with a Psycho/Birds double-bill. Maybe still will, but that would mean watching North By Northwest this week as well and considering how far ahead that would put me, I think it's just vulgar!